Another bunch of console related items arrived this monday, missing the weekend, because I would have enjoyed it too much if the package arrived on friday. Oh well, no point in complaining now, since the stuff is here to stay. Since you always should protect your handheld consoles, especially their sensitive screens, I got myself some new screen protectors for Nintendo DS Lite and PSP 2000, and a crystal case for the DS. 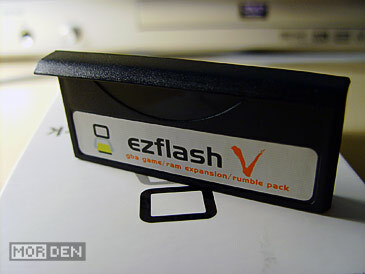 Because accessories that keep your console safe from harm aren't too exciting, I also got a EZ Flash V 3 in 1 espansion cartridge, but I'll get to that in a minute. I'm not a huge fan of external covers for handhelds. 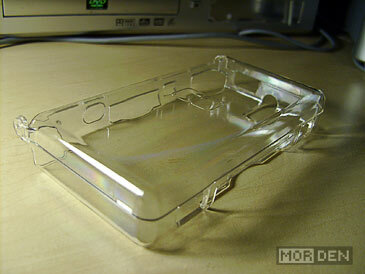 I always keep my consoles in cases designed to protect the hardware when I'm not using it. What ultimately convinced me of getting the crystal case for my DS Lite, was the console's smooth surface combined with its black color, which made it into a fingerprinting machine. I am a clean person and I always wash my hands before I play, but it's simply impossible not to leave fingerprints all over the DS Lite. 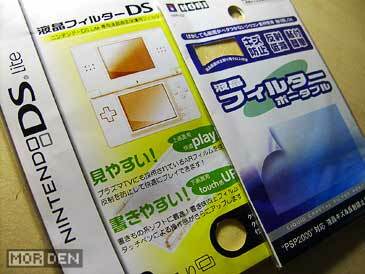 The constant wiping and cleaning may eventually lead to some scratches, and I would much rather wipe the crystal cover than the DS itself. I wasn't expecting much when I ordered this, as it was a $2 product, but I was pleasantly surprised once I put the cover on my DS. It firs perfectly and the console itself is only slightly bigger. I was afraid it would feel awkward to hold it, but it doesn't. 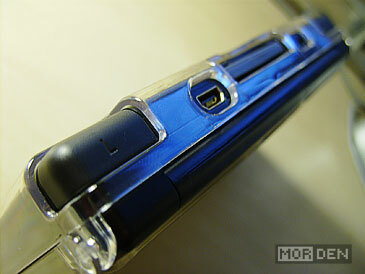 The only thing I did react to was the access to shoulder buttons. The case doesn't cover them in any way, but the fingers can no longer rest in the same way I was used to. It is however only a matter of adjustment. After a few games I didn't really think about it. Changing the volume will feel different as well, but because of the cover you will no longer change the volume accidentally, which did happen to me many, many times. Now, how about that EZ Flash V 3 in 1? I have never really thought about getting one of these, but since many homebrew applications use or even require additional RAM - which I didn't have up until now, because I thought it was pointless to buy a Nintendo DS browser just to get it, and other alternatives seemed a bit expensive - and there are some games that utilize the rumble feature, I thought why not? The price-tag was just under $19 including shipping, and if I didn't get it now, I probably never would. So I ordered it, excited about the new possibilities and some positive vibrations. The first thing I noticed when I took it out of its box was the build quality. It leaves much to be desired and getting it in the first time was a problem. For a second I thought it wouldn't fit the slot, but as it turns out, you have to insert it at a slight angle. Once the cartridge was in, I popped Metroid Prime Hunters into slot one and got ready for the vibrations. No such luck. The game didn't see it. 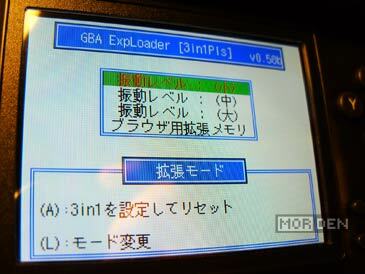 Apparently, I didn't research it well enough, and the rumble feature is available, but only through certain flash cart firmwares or special loaders, which in its turn means that the feature caters to those who use ROM images rather than original games. Supposedly there is a way to make it work with originals, but I haven't had the time to look into it. Since the vibrations didn't work as I thought, I wanted to check what does work. 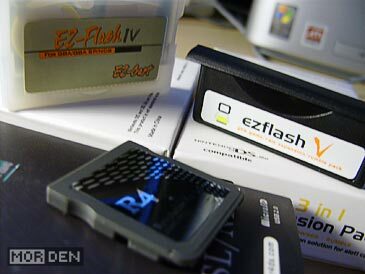 After trying several things I realized that EZ Flash V 3 in 1 is anything but user friendly. In fact, getting it to work seemed like a chore at first, before I read a bunch of documents and downloaded appropriate software. Just to clarify what the three functions of this cartridge are: It is a RAM expansion, a Rumble Pak and a Game Boy Advance flash unit featuring both PSRAM and NOR memory, with the NOR being able to hold only one program at a time. Only after getting Rudolph's GBA ExpLoader I could really test the cartridge. 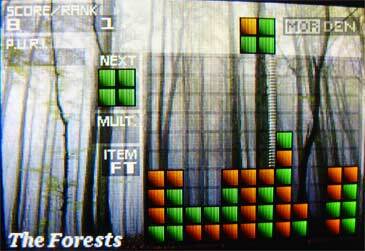 Since the GBA NOR memory can hold only one program, I loaded Gleam, an excellent freeware Lumines clone onto it and that's probably what I'm going to use the GBA feature for the most. It's important to note that EZ Flash V 3 in 1, in conjunction with a slot one flash device, is capable of backing up and restoring original Nintendo DS game save data, as well as backing up whole Nintendo DS games. After the initial failure to get the rumble feature working, I tested the ram expansion, which doesn't require additional programs to run, but the homebrew software has to be compatible with this particular expansion model. Not too long ago, a ScummVM porter named Agentq released a special ScummVM DS build capable of running SCUMM Ver. 7 games, Full Throttle and The Dig, utilizing RAM expansion. This was the first homebrew application I tested the extended RAM function with, so I had my fingers crossed when booting it, but it worked. 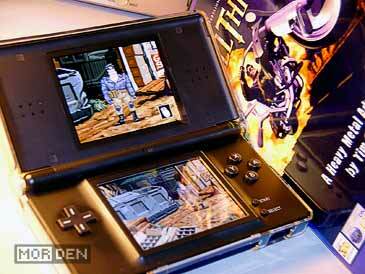 So far I have only tested Full Throttle, which I recently completed on PSP. Sadly, the save games weren't compatible, so to see if the game really works, I will have to finish it, which I might, since I have all of the puzzles fresh in my memory. I haven't tested The Dig yet, but since it's the same SCUMM version, I can't see a reason why it wouldn't run. Another homebrew application using the RAM expansion is the Quake 2 port by Drunken Coders. While the DS port of Quake did not require additional RAM to run, but did use it for improved performance if an expansion was present, Quake 2 won't start without it, as it is more demanding a game, with more detailed models and texturing. First Quake running on a DS is impressive in itself, but seeing Quake 2 run at an acceptable and playable speed is awesome. I only took the demo pak for a quick spin, but I'll probably be loading the whole game onto my R4 soon. I am really curious how this port will do later in the game and whether or not it will work with the Quake 2 expansions. Well, that's about it, I think. I know there's a lot of bitching and whining in this entry, but if you're considering a purchase of EZ Flash V 3 in 1, don't be discouraged. Just know that it won't work out of the box, since it was designed to work with the slot one EZ Flash V, which supports the expansion from the firmware level. I did get the vibrations to work using ROM images of the games I legally own - The only thing I had to do, was to start the GBA ExpLoader and choose the vibration strength. There are about fifty Nintendo DS games that use the rumble feature, so it's nice to know I can feel those vibrations if I really want to - In other words, I won't completely neglect the rumble functionality. 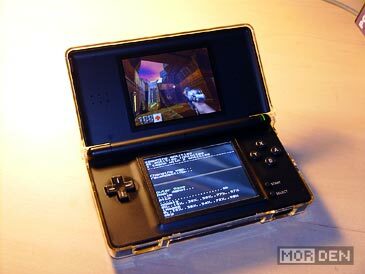 I will however continue using the EZ Flash IV when it comes to Game Boy Advance homebrew in general, but running Full Throttle, The Dig or Quake 2 wouldn't be possible without the RAM expansion. All in all, I think this little gadget was worth the money I paid for it. I will have some fun with it, and the best part is, since it's black and shaped like the original slot 2 cover, you won't even know it's there. 2009.10.14 Wed Wii ☆ Nintendo DS Comment Tweet This!